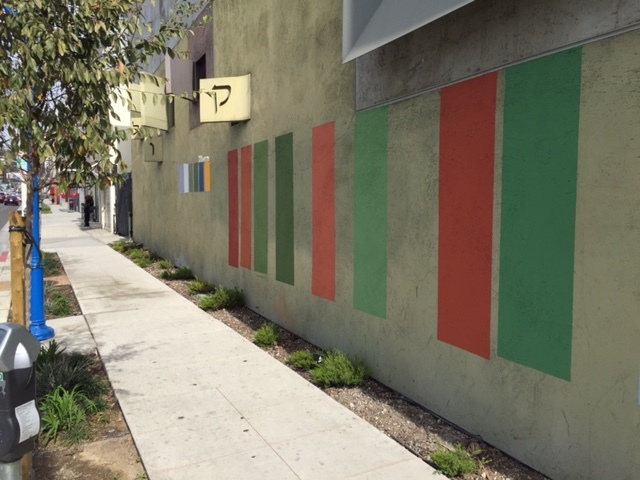 A test of stripes of various colors on the facade of Congregation Kol Ami’s synagogue on La Brea Avenue. It was a little more than seven months ago when a stolen Tesla racing at 100 miles an hour crashed into the wall of Congregation Kol Ami‘s synagogue on La Brea Avenue. Then it was the remains of the car, wedged into the synagogue’s La Brea door, that caught the attention of passersby. Now what’s eye catching are colorful stripes on the La Brea facade that signal a significant refreshing of an institution that was a pioneer in the redevelopment of West Hollywood’s Eastside. 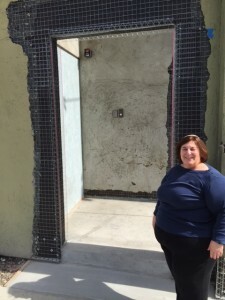 Rabbi Denise Eger outside the new doorway on La Brea Avenue of Congregation Kol Ami’s synagogue. The various colors are a test, Rabbi Denise Eger explained, to determine what will be the new color of an architecturally significant building whose facade has faded into gray. The repairs to the front of the building also will include creating an obvious opening to La Brea Avenue that signal the changes that have occurred there since the synagogue was built in 2001. “We were here before the Gateway,” Rabbi Eger said, referring to the shopping plaza that anchors the southwestern corner of La Brea and Santa Monica boulevards. “It was a carwash then.” And at night that area of La Brea was known as a place where prostitutes looked for clients and thieves lurked in the shadows. Now, with the Gateway and developments such as the Huxley and Dylan apartments buildings and the city’s refreshing of the landscape along La Brea from Fountain to Romaine, the Eastside is attracting relatively prosperous young professionals. Kol Ami not only was a pioneer in the revival of the city’s Eastside, it also was a pioneer in developing an accepting congregation for West Hollywood’s gay and lesbian Jewish population. Some of its members didn’t feel comfortable at he Chabad Russian Synagogue on Santa Monica Boulevard, affiliated with the Hasidic movement, or the former Temple Bet El on North Cresent Heights Boulevard occupied by the Iranian-American Jewish Federation. The La Brea synagogue was designed by John Sweitzer as a building that The New York Times described as “a modern synagogue that seems deeply spiritual.” The repairs to its facade, expected to be finished next month, also have inspired the congregation to repaint the interior of the synagogue. Rabbi Eger said she sees a miracle in the crash, awful as it was with injuries to six people and the death of the driver. For one thing, while it happened on a Friday night on July 4, there were no members of the congregation inside. And for another, the work on the facade, and the prominent door, will give Congregation Kol Ami a bright new presence on La Brea Avenue. architecturally significant building ??? What makes it so? Also, red or green for a synagogue? The facade has not faded to grey, it has always been grey. It looks good grey. The Tesla was the second car to make a crash landing in the doorway.